Bob Mitchell has now made it a habit, or maybe we should call it a way of life, to become interested in things, after he decided to run for office. He has been recorded as saying, he was too busy raising his children to be involved in politics. So much so, he never participated in the Sussex GOP at any level. He never put in any time on campaigns, at least none he has bragged about, and believe me, he would have bragged about them. Even his voting record has some large meaningful gaps in it. Why, he was so busy raising his children, he didn’t have time to take note of the condition of the public school system. But now, that he is running, it seems as though he is desperately concerned about the public school system. In a local news paper, Bob Mitchell ran this ad. 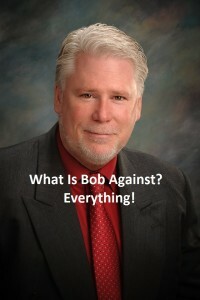 Isn’t odd, that good old Bob is now so very interested in the public school system? Just look what he had to say, “our SAT scores are the lowest in the country while our spending is among the highest”. It’s always about the money with good old Bob, isn’t it? Because unless I am mistaken, while Bob was so busy raising his children, he didn’t take the time to participate in the PTA at Woodbridge. Since my wife was a member of the PTA, and since I believe at least one of his children is the same age as my daughter, he would have been hard to miss. But maybe there is a clue as to why Bob was too busy raising his children to be able to participate in the public school system. Let us look at this from the ad. “My experience as a father of three recent graduates and my position on a local school board gives me a unique perspective on what works and doesn’t work in our schools”. Well isn’t that just dandy? One small problem, I don’t think Bob’s children went to public schools, in fact, I don’t even think Bob went to public schools. And the Board he is on, is, that’s right, a private school. So, again, Bob Mitchell has never been involved in the public school system, never tried to make it better by participating, either by sending his children there and working with the district and teachers and other parents. No, just like he has no experience in politics, he has no experience with the public school system. Yet he would have the voters of the 35th believe he can solve the problems. And just like his arrogance of thinking he knows all there is to know about how to fix Dover, now he wants us to believe he knows all there is to know about how to fix a system he never participated in. 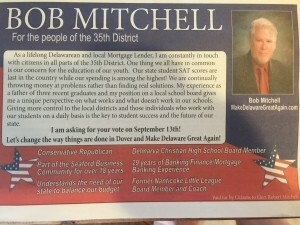 This is just another Bob Mitchell attempt to look like a legitimate candidate. But what it really shows, is that if elected, Bob would bring his private school bias to the table, and do nothing but work to destroy, rather than build or repair our public schools. I am not suggesting people don’t have a right to send their children to private schools, nor am I saying our public schools don’t need help. But I do have a problem with a person who has never had a child in public school, never was active in the public school system, thinking they can simply apply the private school doctrine to public schools and solve all the problems. The two are so diametrically different, with different challenges, that to think one will simply plug into the other, is more than arrogant, it is simple-minded. One more thing from the ad. “Understands the need of our state to balance our budget”. 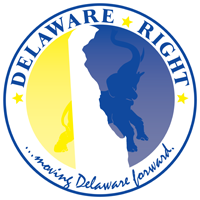 Well maybe Bob doesn’t understand the state of Delaware has a constitutional requirement for a balanced budget. What else doesn’t Bob understand? One more reason Republican voters, of the 35th Representative District, must come out on September 13th and vote for Dave Wilson, a proven leader. 9 Comments on "Bob Mitchell, Late Again!" …vote for Dave Wilson, a proven leader. And a man with first hand experience with our farmland giveaway program. Has anyone here been to the moon? I hear that it’s pretty far away and requires the use of a spaceship to get there. Supposedly, it’s dry, cold, dusty and with no oxygen and light gravity. But I can’t really talk about it because I’ve never been there. He’s constantly in touch with people from all over the 35th District? He means everyone except for the Mayor of Greenwood, because he still does not even know who that is. Rick, I didn’t say he couldn’t talk about it. But he states he has a unique perspective on what our schools need. I would contend Bob Mitchell is anything but unique. And that people who have had children in the system have a better and more practical perspective than does a man who suddenly woke up one morning, decided to run for office and needed a reason. Bob has one reason, Cindy Green talked him into it. Tom, maybe you didn’t notice or don’t understand. This post is about the 35th District Republican primary. 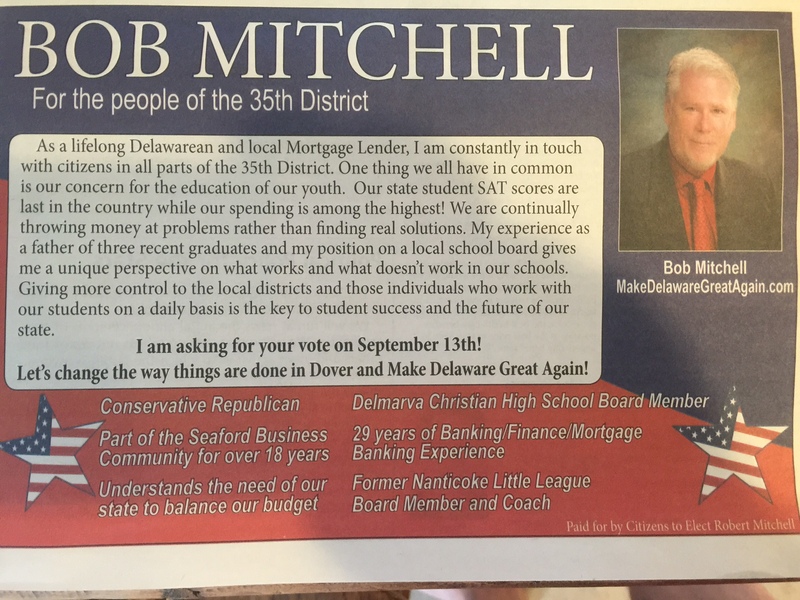 Bob Mitchell is running against Dave Wilson, a proven conservative. Not sure what “Go Trump” has to do with it, unless you are one of those people who it’s all you’ve got. This state is too broke for “infrastructure” expenditures. Look at the pathetic state of Rt. 9, 24, and the Five Points intersection. The land along these areas has been plotted for development for years, and rapid growth has been occurring since the early 90’s. There are no surprises. The state is utterly derelict. But, we have a fine needle exchange program. ← Who The Hell Is We?